Before EA Sports rolls out FIFA 19’s improved green carpet to everyone later in September, it provided a tease in the form of a demo, released Thursday on PC, PS4, and Xbox One. Having spent a couple of hours with it — which is far from enough to make any conclusive judgements, mind you — we noticed the biggest changes in the FIFA 19 demo, in terms of gameplay, were how the AI’s style of play is more human-like and the introduction of a new optional shooting mechanism that has the potential to shake things up. With the former, the AI in FIFA 19 demo strung together passes at a rapid rate, much faster than it does in FIFA 18 and much like you need to against human opponents. It marks a further shift for EA Sports towards a frenetic style of football, something its rival Pro Evolution Soccer fully embraced a few years ago, though it’s bound to be disappointing for the tiki-taka lovers. Of course, it’s possible this is only true for the big teams — the demo features some of the planet’s biggest clubs such as Real Madrid and Paris Saint-Germain — who have the players to pull it off. While we will have to wait for the full game to find out how the other clubs — who don’t have the liberty of players with high passing stats — play in FIFA 19, it was interesting that the AI in FIFA 19 demo still couldn’t find a way to score against us, creating only a single clear-cut chance in half a dozen matches. That brings us to the new shooting mechanism, which is called ‘Timed Finishing’ in FIFA 19. It promises more power and more accuracy for shots, headers and volleys as part of a risk vs reward system. Here’s how it works: you hold down the shoot button for power on the first press, and then you tap it to activate Timed Finishing on the second press (the low driven shot, which earlier used double tap, has hence been moved to L1 + R1 + shoot). Get it right and your shots will fly into the top corner. Get it wrong and the ball will end up in the stands. EA knows that players will need time to learn and practise Timed Finishing, which is why the new system has also been woven into the FIFA Trainer, the heads-up display that hovers around the player you are controlling. If you are one of those who can play with it turned on — seriously, who are you lot? — you will see a new shot timing bar above your player, like the one used for penalties in old FIFA titles. It’s a good way of getting the hang of Timed Finishing. And if you keep the trainer turned off, FIFA 19 will indicate timing by lighting up your player triangle icon in green (good) or red (bad). And of course, you can turn it off altogether from the customise controls menu, where you will also spot two other optional assists: Pass Block Assistance and Second Defender Switch Icon. With the former, your AI teammates will try to intercept passes. The latter, borrowed straight out of PES, displays a translucent icon on the teammate you will get control of if you hit the switch player button. It also serves as an indicator of the player that will defend when you activate teammate press. Off the pitch, FIFA 19 has two big tactical changes to the team management screen. The more obvious one is the introduction of ‘Game Plans’, which serves as a much-needed upgrade to team mentality. While previous FIFA titles had the option to pick from five styles — Park the Bus, Defensive, Balanced, Attacking, and All-Out Attack — players couldn’t define how exactly the team played. With Game Plans in FIFA 19, you can now set tactics for all five, with Park the Bus and All-Out Attack having been rebranded as Ultra Defensive and Ultra Attacking, respectively. It’s another aspect that PES did before, though Konami only allows three. The second of those changes is a revamped tactics screen, which gets rid of all the 1-100 numerical toggles that have been present for years. EA has been calling it ‘Dynamic Tactics’ ever since it announced the game and we now know what it brings in full. In FIFA 19, players can choose from five defensive styles such as constant pressure, drop back, balanced, pressure on heavy touch, press after possession loss; and four attacking styles in possession, balanced, long ball, fast build up. Additionally, you can specify width and depth for defence; and width, players in box, corners and free-kicks under attack. 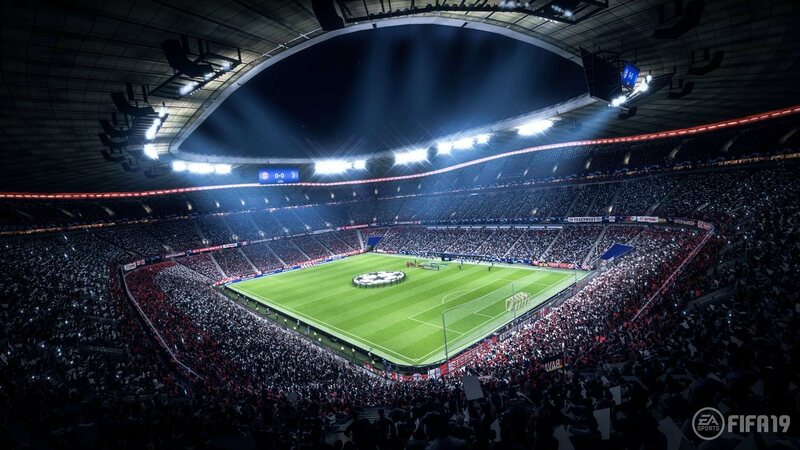 FIFA 19 demo also gives us our first proper look at the Champions League experience that will be available in the full game, alongside other UEFA licenses. In addition to a new commentary team consisting of Derek Rae and Lee Dixon, who will be known to football soccer fans in the US, Champions League brings a new broadcast package that looks nothing like what TV viewers will recall. And that’s because UEFA has changed it for the new 2018-19 season, which you haven’t seen because the Champions League group stage only starts next week. Aside from the Champions League kick-off mode, the FIFA 19 demo includes a (tiny) glimpse of The Journey: Champions, the third and final chapter of the story-based mode featuring Alex Hunter. Though three characters will be playable in the full game — Alex’s best friend Danny Williams, and his step-sister Kim Hunter being the other two — the demo only includes a snippet of Alex’s career where he’s already at Real Madrid. We were annoyed to find out that the demo gives you control of the full team, as opposed to just Hunter, which is symptomatic of EA being a fan-pleasing developer. Of course, the full game will allow you to choose between controlling Hunter or the entire team. Beyond that, the demo revealed a couple of new features including detailed stats tracking on your matches against the AI, which gives you an idea of how you’re playing and what you could be doing better; and a tweaked change-kick-taker menu for set-pieces, which is now much easier to understand and parse thanks to green- and red-coloured indications for comparisons between players, which tells you at a quick glance who’s better or worse. For now, the overall changes to gameplay in FIFA 19 feel minimal — Timed Finishing feels like a gamble and will definitely be at the centre of much debate, while it’s too soon to tell if FIFA 18’s arcade-y aspects such as unrealistic long shots have been worked upon — though we will need more time to properly assess that. We can’t wait to get our hands on the full game and share our experiences with you in our full FIFA 19 review.